(Tech Xplore)—Creepy and mesmerizing. That's how Gizmodo this week reacted to an NVIDIA paper that shows the way a neural network can now render photorealistic faces—of people who never existed. Some tech-watching sites could not look away. The NVIDIA paper from researchers shows a way to generate faces via a generative adversarial network (GAN). Tom McKay in Gizmodo described GAN as "a class of algorithm where researchers pair two competing neural networks against each other." So one of the two has a generative function, like rendering images or trying to solve a problem, but the other is in adversarial mode, challenging the first's results. Two neural networks based on algorithms used in unsupervised machine learning—this in itself, said Hilary Grigonis in Digital Trends, "pushes artificial intelligence to 'learn' through trial and error without human intervention, such as separating images of cats and dogs into two groups." "The key idea is to grow both the generator and discriminator progressively, starting from low-resolution images, and add new layers that deal with higher resolution details as the training progresses. This greatly stabilizes the training and allows us to produce images of unprecedented quality." On the NVIDIA Research page, the team said they also described several implementation details "important for discouraging unhealthy competition between the generator and discriminator." Paul Lilly reminded readers that GAN itself is not new; what is special is the "progressive training method" that NVIDIA developed. "NVIDIA took a database of photographs of famous people and used that to train its system. By working together, the neural networks were able to produce fake images that are nearly indistinguishable from real human photographs." They worked with the CelebA HQ database of famous faces. "We trained the network on a single NVIDIA Tesla P100 GPU for 20 days," said the authors, "after which we no longer observed qualitative differences between the results of consecutive training iterations." The paper is titled "Progressive Growing of GANs for Improved Quality, Stability, and Variation," by Tero Karras, Timo Aila, Samuli Laine and Jaakko Lehtinen. The paper was submitted to the International Conference on Learning Representation 2018. What challenges are still out there? 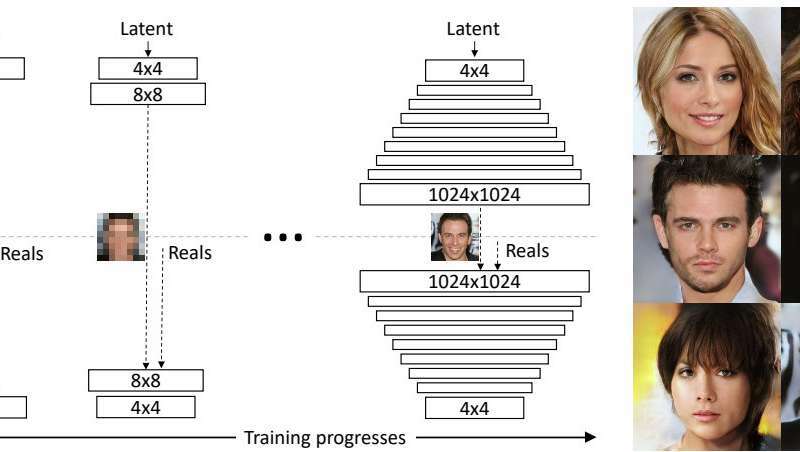 "While the quality of our results is generally high compared to earlier work on GANs, and the training is stable in large resolutions, there is a long way to true photorealism," the authors stated. "Semantic sensibility and understanding dataset-dependent constraints, such as certain objects being straight rather than curved, leaves a lot to be desired. There is also room for improvement in the micro-structure of the images." At the same time, the authors said "convincing realism may now be within reach, especially in CelebA HQ." Dom Galeon in Futurism: "The system is the latest example of how AI is blurring the line between the "real" and the fabricated." Dave Gershgorn, Quartz: "The era of easily-faked photos is quickly emerging—much as it did when Photoshop became widely prevalent—so it's a good time to remember we shouldn't trust everything we see."